The simplest fog solution housed in a professional body. 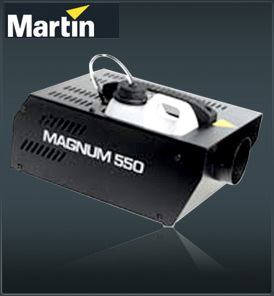 The Martin Magnum 550 fog machine provides the DJ with a perfect boost of dense white fog to enhance every light effect. Its fast heat-up time and extended operational period make the Martin Magnum 550 the clear leader in its class. Housing a 600-watt ECO-Mass Vaporizing System for economical and even distribution of fog, and supplied with a remote control, the Martin Magnum 550 will give many years of maintenance-free operation. The 550 is fitted with the same high quality protection as the Magnum 2000 providing an economical solution with absolutely no compromise. Built tough with a rugged chassis, the Martin Magnum 550 is perfect for the mobile DJ and more grinding environments .